This public art program, at the scale of the looming transportation infrastructure, elevates the pedestrian experience of the transit village. A line of blue “dancing” street lights, crooked like musical notes, recalls 7th Street as a hub of once Jazz/Blues culture. A gateway structure, designed in response to community requests, conceived of in the style of a freeway exit sign, is emblazoned with the faces of local and national African American leaders. 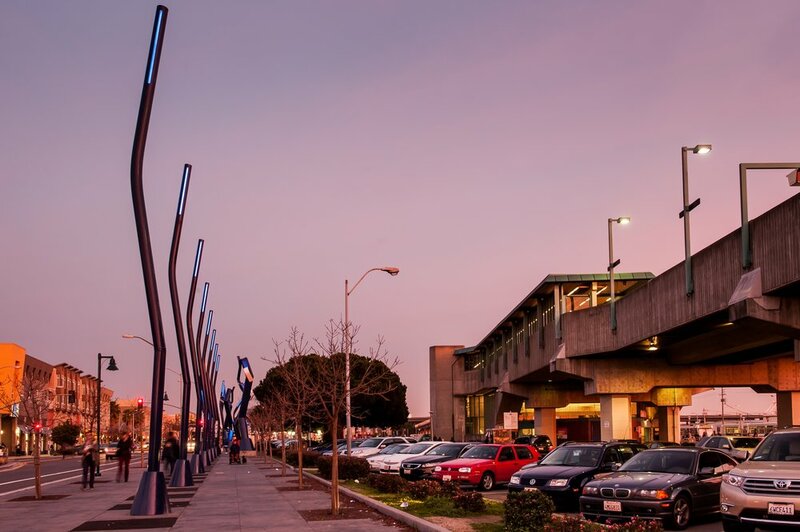 The gateway and dancing lights aim to create a destination that instills a sense of ownership among the West Oakland neighborhood, mediating adverse impacts of transportation infrastructure and building upon a rich historical/cultural context.